Our Wedding Coordinator Jeanne ensures Crimson Hair Studio creates Philadelphia’s Best Wedding Hair and the most Beautiful Bridal Styles! 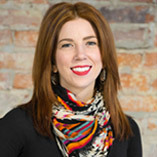 Jeanne is Crimson Hair Studio’s designated Wedding Coordinator & Bridal Style Specialist: she is a super-talented hairstylist who creates each bride’s especially stunning look, & coordinates their seamless string of bridal style experiences! What to Expect from your Crimson Hair Studio Wedding Experience! Let’s Talk: Email crimsonphilly@gmail.com or call 215-545-7807 to setup a phone call with Wedding Coordinator & Bridal Style Specialist Jeanne. 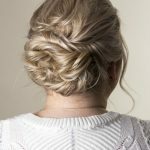 You can discuss your hair type, hair & makeup style inspirations (photos encouraged!) & overall day-of event expectations. 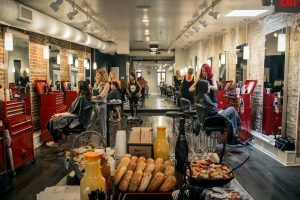 Style Consult & Trial: Come to Crimson for your Bridal Trial; our Rittenhouse Square location is the perfect place to welcome your wedding party according to Phillymag! You will get a feel for a spacious layout, cool vibe, & talented team, while getting a glimpse of your future Mrs. style! You & Jeanne will continue the conversation about the options available for achieving your best possible look, including: hair color, length/thickness, & accessories, as well as the opportunity to have your Makeup Trial. Color: If you always envisioned yourself as a blonde bride, now may be the time to start that process so you have the perfect highlights. You want to take each step toward a color transition slowly & with care, so plan color changes in advance. Length & Thickness/Extension Options: Crimson Hair Studio offers multiple options for customized extensions: Keratin Bonded, Tape-In, Clip-in, & Halo Couture. The entire Crimson staff is Hot Heads, So Cap, and Babe certified. Keratin Bonded – Your hair will be matched with strands of real unprocessed hair & will be attached using keratin-based glue. They can be treated the same way you treat your own hair, whether you want to curl it, straighten it, or even dye it. Tape-In – Thin tape wefts that are taped in between your real hair. In addition to being strong, they are also non-damaging. Clip-In – Custom clip-in pieces are crafted to perfectly match your hair color and hairstyle needs. They are temporary, with pressure sensitive clips, & no long-term bonding or any damage. You can even get Clip In bangs! Halo Couture – A transparent thread drapes around the crown of your head, instantly adding length & volume! Accent Pieces: If you have your veil or love the glitter of diamond combs bring them in & we can try them out with your look! We love the pieces by LELET NY! PRO TIP: Schedule your trial for the same day as your Engagement Photos, Engagement Party, or other special (highly photographed) event. Men’s Hair: Jeanne (as well as the whole Crimson crew!) are expert barbers & can get the men in your life ship shape too! Makeup Trial: Crimson’s talented stylists work with a beautiful makeup kit for photo-perfect results. Wedding Experience: Crimson Hair Studio offers a personalized wedding experience from start to finish; our large salon & talented team can accommodate your wedding party’s beauty needs. All hair & makeup appointments will be booked with appropriate stylists & perfectly coordinated! Added Style: Your Bridal Style includes a style prep service the day before your wedding! 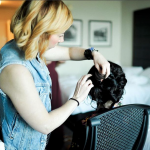 This additional service will ensure perfect day-of hair & make you look fabulous at your rehearsal dinner! 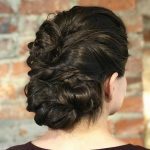 Jeanne will continue to be your style guru & salon contact until the big day! She will followup with the bride, the bridal party, & guests with tips to prepare their hair & skin for an especially beautiful big day! 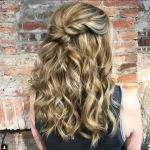 Wedding Day Packages: Starting at $200 for bridal hair, this beautiful experience also includes the Crimson complimentary day-before style prep. Bring Crimson to your Suite: Crimson Stylists are available to travel to your home, hotel, or Hawaii (!) for your big day! The cost will vary based on distance, number of stylists, number of people being beautified.